If your breed (see list) is predisposed to tearing, runny eyes and eye stains, treat the cause and get this new 100% safe and effective product to eliminate unsightly eye stains. 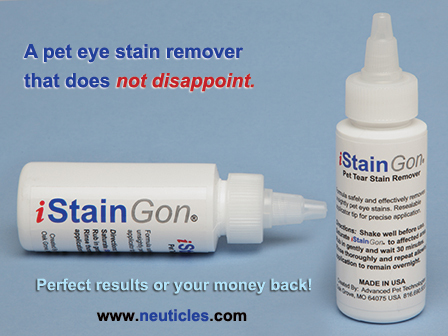 What causes eye stain, Stain-Gon solutions, breeds prone to tearing problems, easy options to clear up those tear stains and restore your dog's beautiful expression. Excessive tearing can occur as a result of a constant irritation to your dog’s eyes or because your dog’s tears are not draining properly. Ectropion: an abnormal rolling out of the eyelids. Glaucoma: abnormally high pressure in the eye. Lens luxation:  the lens in the eye is displaced and not in a normal position. Atresia of nasolacrimal puncta: a condition where the holes on the inside of the lower eyelids (puncta) are too small, closed or blocked so tears spill over the lid instead of draining to the nose. Corneal dystrophy: an abnormality of the cornea usually characterized by shallow pits (eye socket). Entropion: an abnormal rolling in of the eyelid. Lacrimal duct atresia: a condition where the duct draining tears from the eye is too small or not formed. Any dog, regardless of the breed, whether purebred or not, can have eye stains. White dogs are more likely to have visible tear stains on their face because the pigment in their tears will show up against the white hair as reddish-brown streaks. Dogs with long hair on their face may also be more prone to excessive tearing because the hair wicks tears away from the eye and onto the face. Short-nosed dog breeds, such as Shih Tzu, Pekingese, Maltese, and Pugs may be more prone to eye staining because they often have shallow eye sockets or hair growth in the skin folds around their eyes. Cocker Spaniels and Poodles may be prone to blocked tear ducts. Airedale Terrier, Afghan Hound, Akita, Alaskan Malamute, Antarctic Husky, American Cocker Spaniel, American Staffordshire Terrier, Australian Cattle Dog (Australian Blue Heeler), Bassett Hound, Beagle, Bedlington Terrier, Bernese Mountain Dog, Bichon Frise, Black & Tan Coonhound, Bloodhound, Border Collie, Border Terrier, Boston Terrier, Boxer, Brittany Spaniel, Bullmastiff, Bull Terrier, Brussels Griffon, Cardigan Welsh Corgi, Cairn Terrier, Cavalier King Charles Spaniel, Chesapeake Bay Retriever, Chihuahua, Chinese Shar Pei, Chow Chow, Clumber Spaniel, Collie, Curly-coated Retriever, Dalmatian, Dandie Dinmont Terrier, Doberman Pinscher, English Bulldog, English Cocker Spaniel, English Setter, English Springer Spaniel, English Toy Spaniel, Flat-coated Retriever, French Bulldog, Golden Retriever, German Shepherd, German Shorthaired Pointer, German Wirehaired Pointer, Giant Schnauzer, Golden Retriever, Gordon Setter, Great Dane, Great Pyrenees, Greyhound, Irish Setter, Irish Wolfhound, Italian Greyhound, Jack Russell Terrier, Japanese Spaniel (Chin), Kerry Blue Terrier, Komondor, Kuvasz, Labrador Retriever, Lakeland Terrier, Lhasa Apso, Keeshond, Maltese, Mastiff, Miniature Bull Terrier, Miniature Pinscher, Miniature Poodle, Miniature Schnauzer, Neapolitan Mastiff, Newfoundland, Norwegian Elkhound, Norwich Terrier, Old English Sheepdog, Papillion, Pekingese, Pembroke Welsh Corgi, Pointer, Pomeranian, Pug, Rhodesian Ridgeback, Rottweiler, Saint Bernard, Saluki, Samoyed, Schipperke, Scottish Terrier, Sealyham Terrier, Shih Tzu, Siberian Husky, Skye Terrier, Smooth Fox Terrier, Spinoni Italiani, Standard Dachshund, Standard Manchester Terrier, Standard Poodle, Standard Schnauzer, Sussex Spaniel, Tibetan Terrier, Toy Poodle, Vizsla, Weimaraner, Welsh Springer Spaniel, Welsh Terrier, West Highland White Terrier, Whippet, Wirehaired Fox Terrier, Yorkshire Terrier. Eliminate the source of irritation. This might include keeping hair near the eyes trimmed very short and treating infection, glaucoma, or other eye problems. Regular washing of your dog's face (use tearless shampoo) can help, as can eye ointments and antibiotics but avoid prolonged antibiotic treatment which could lead to drug-resistant bacteria  which is something far worse than eye stains. A new product released by CTI Corp eliminates pet eye stains. Dubbed i StainGon®, the product is 100% safe and effective. There are also surgical options for eyelid/eyelash problems which could help normal tear drainage and eliminate overflow onto the face. Always check with your veterinarian first but he/she should already know about this non-prescription, inexpensive new treatment.